Your life may be better for having read it - though much sadder. Fascinatingly the author points his finger at his own father as one of the conspirators to kill JFK. This story is as much about the incestuous web of insiders in DC at that time as it is about drugs, JFK and Mary. Leery figures prominently in the web. It may expand your consciousness as much as a tab of your favorite thing. This book actually posits that JFK's acid trips are what swung him away from the status quo and toward a future of peace. it's not often I get attached to people in books but something about the telling of this story makes me hurt for JFK and Mary, and all of Us. Edited by pharmer, 27 May 2018 - 11:32 AM. I know about the story, and it is tragic. It is a very human story, making John Kennedy someone very real, and our deep state players, very much what they are. Peter Janney’s book is a must read. 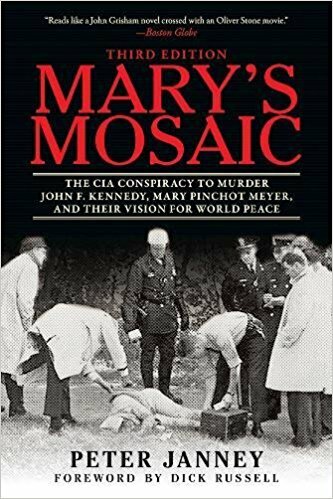 Mary Pinchot Meyer was dosing JFK. They were both murdered to stop the change that was unfolding.